Born in Germany (1966). Studied Graphic-Design in Karlsruhe. Freelance designer since 1996. Held teaching assignments in Halle, Weimar and Wuppertal. 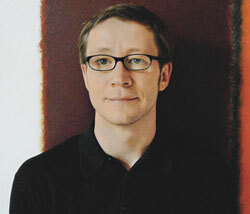 In 2006 Erik Faulhaber designed Generis®. Generis is a system of four compatible typeface families, each variant drawn in a different generic style, perfectly suitable for almost any design application. In 2009, Erik Faulhaber created Aeonis™, a classic-style sans serif typeface family with a clear, minimalistic design. In 2013, Erik Faulhaber presented Xenois™, a perfectly coordinated font family that provides an innovative take on the Antiqua typeface class. In 2016, Erik Faulhaber designed the geometric, futuristic Quantis Sans and the round, warm Quantis Soft, which can be used in combination with Quantis Sans or alone. Read also the interview with Erik Faulhaber.